This delicious simple egg drop soup recipe with seaweed takes just 15 minutes to cook and prep! Seaweed is one of my favourite things to eat whether it is in salad, wrapped with sushi or boiled in soups. It makes a comforting light meal or a side dish. 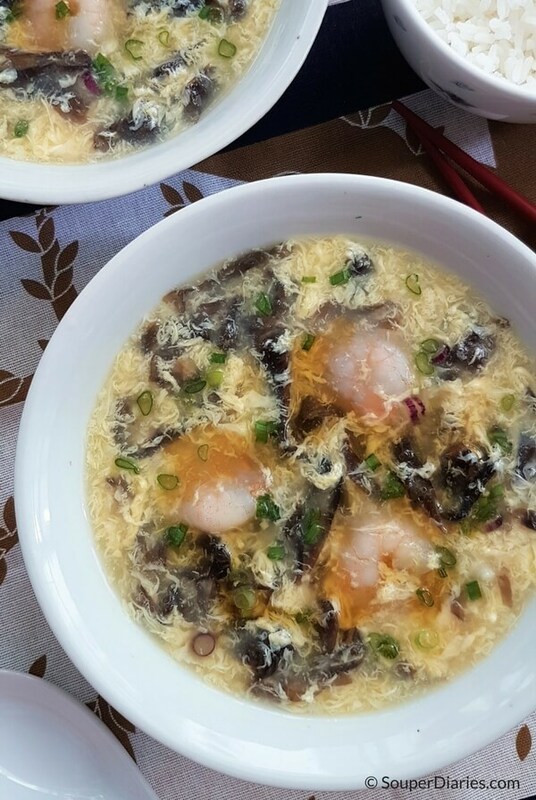 The Chinese laver used in this seaweed egg drop soup does not require much if any cooking. When it comes into contact with the broth, the seaweed will soften and can be consumed immediately. You just need a small portion of it since it will expand when rehydrated. It is sold in circular sheets (as shown in the picture below) in the Asian section of a supermarket, certain Chinese medical halls or a Chinese dried provisions shop. 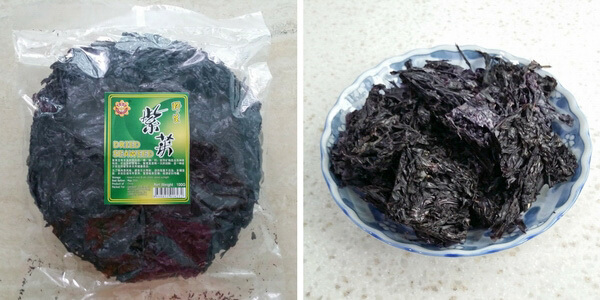 Besides this seaweed, other types of seaweed can be used too. Select those that are suitable for soups. Below are some examples. Seaweed is high in nutrients and low in calories. Some of the reasons to eat seaweed include: It has detoxing properties, help regulate hormones and is generally good for health. The people in Okinawa, an island southwest of Japan are famous for their longevity. Okinawans eat more tofu and konbu seaweed compared to people from other parts of the world. Seaweed is rich in Vitamin A, C, D and B6. It also contains high levels of folate, iron and iodine. High iodine content is what gives seaweed its distinctive flavour. I usually have soup with seaweed as a light side dish. If you want to turn this into a light meal, you may add other ingredients such as shrimps or mushrooms. However, I don’t recommend adding too many ingredients into an egg drop soup as they are meant to be quick cooking, light and uncomplicated. 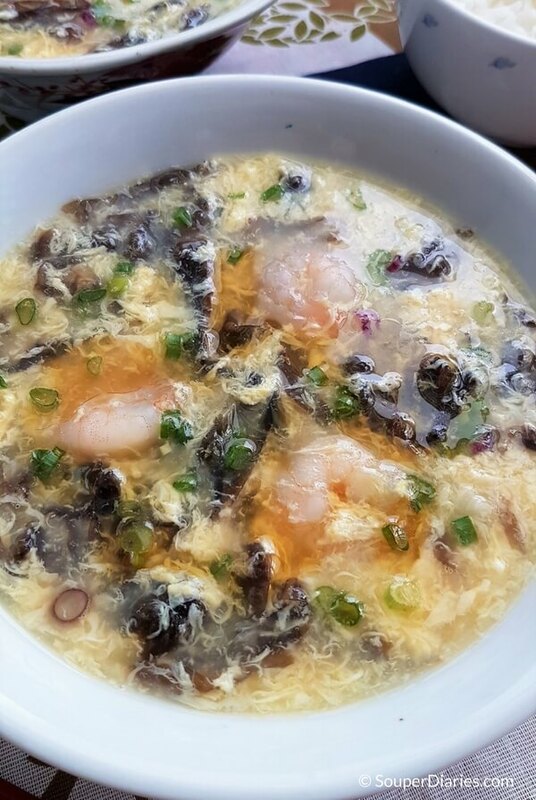 Simple egg drop soup with seaweed and prawns. Great as a light meal or side dish. Pour in stock and water into a soup pot along with the ginger and let boil. Once boiling, add the prawns and cornstarch slurry. Cover lid and bring to a boil again. Turn off heat and remove the ginger. Slowly pour in the eggs with one hand and stir the soup with your other hand using a pair of chopsticks or fork. Stir more frequently if you want a more 'ribbon' like eggs or stir at a slower pace for larger egg strands. Season with salt if necessary. Add the seaweed and gently stir to loosen them. Drizzle sesame oil and garnish with chopped spring onions. Serve immediately. I have never heard of egg drop soup before, but I’m a big fan of egg and seaweed so I might give this a go! All the seaweed recommended here are mild in flavor. The seaweed that I used for this soup is Chinese laver and the taste is also quite mild. Very nice recipe, will try tomorrow night. Hopefully my wife will like it! very nice site. i love Asian food and i am always looking to try something new. Thanks a bunch for the egg drop soup.